Here's a look at the Sharpening Kit to get Scary Sharp Knives! Marty... No argument here. My only question is where you find the 4500 and 8000 grit. The largest grade that I've ever run across is 2000. You can get everything at his web site. Thanks jjmg!... I didn't realize that the post was actually a very subtle sales pitch. I'd never heard of Mr. Leenhouts before. Outstanding Woodburner....Those prices aren't bad. I paid NAPA $1.50 a sheet the last time I purchased a selection from 400 grit to 1200 grit. There are at least three different grit grading systems which don't define grit particle sizes. 3M does. I'm guessing that 4500 and 8000 would be in realm of honing compounds, metallic oxides, of Chromium, Aluminum, Copper and Iron. Leonard Lee published scanning electron microscope pictures of freshly sharpened edges (National Research Council of Canada). Clearly, 1,500 grit is max. Steel is plastic and cannot be sharpened any better than that plus some honing with a fine abrasive such as CrOx or AlOx. Those are commonly available as is an iron oxide, jeweller's rouge (aka "rust"). 1,500 grit is measured by the 3M Corp as = 3 micron nominal particle size. So, I abandoned all the materials and time consumed going beyond this advice. Sure, this is just my opinion based on practical experience. The SEM pictures have been on the books since 1995. You will find that you can buy, in any quantity, fine wet& dry sandpapers from 3M all the way up to 2,500 grit. They are all labelled with the nominal particle sizes, just facts, no subjective BS opinions about "fine" and "super'fine" and "cosmically wonderful fine.". Rob.... 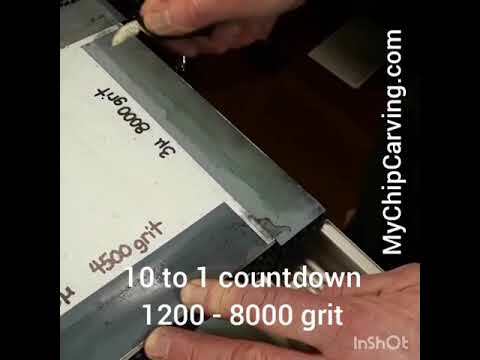 I've never come across the need to go higher than 2000 grit or 8 microns which ever you want to call it. When ever I do put a knife to sandpaper I always follow up by stropping my knives with white compound and then re-stropping them on bare leather to clean off and residual compound. Absolutely true as can be. LL recommended (by the SEM pictures) to stop at 1,500 (3 microns) then strop with the honing compound of your choice. I read you like Aluminum Oxide (0.25 micron), which is good stuff. I've got bars of green Chromium Oxide (0.5 micron) which are doped with AlOx. I had to switch to papers for all the curved knife and adze edges. My 1k and 4k waterstones are under my bench. They have not seen the light of day for several years now. Outlived their usefulness, I suppose. Eddy, I have taken a Chip Carving class from Marty. He is an excellent teacher and author of "Chip Carving Essentials". Thanks for all of the feedback from my post. Sharpening is making smaller and smaller "scratches" on the steel. The finer the scratch the sharper the edge. For years I sharpened with ceramic stones that ended with white at about 1800 grit. I knew I could get a better edge which led to this Sharpening Kit. It really works and does create a much sharper edge than stopping at 1800 or 2200. I put this Kit together and sell it because it works and is less expensive than one small ceramic stone. Sure, you can use Japanese Water Stones to get an equally sharp edge but the cost isn't equal. As mentioned, I do sell the Kit and individual self-adhesive silicon carbide strips and sheets on my website. I looked high and low to find a wholesaler for the 3M self-adhesive abrasives so you can save yourself the time. The intent of my post is to help you get a sharp edge which is so crucial for carving. I'm always interested in your feedback. Thanks much.